A cigarette tube loading machine or "shooter" allows you to professionally and quickly load a cigarette tube (an empty cigarette fitted with a filter only) with commercial RYO tobacco or home-grown pre-cut tobacco so that the end result looks just like a tailor-made cigarette. 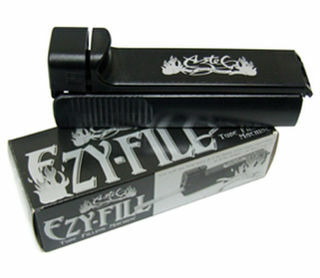 Cover end can be squeezed to lock the cigarette tube on to the nozzle. For regular length and diameter cigarette tubes. 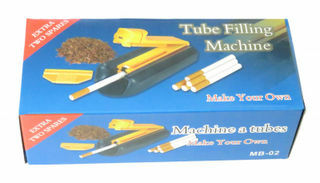 Load this machine with loose tobacco, tamp down with the tamper supplied, squeeze the tube gripper and inject tobacco into empty filter tube with a sliding action.